Single cut solid body electric from Eastman now in Goldtop nitro. Great playing and sounding Single Cut!!! Love those Lollar P-90's !!! 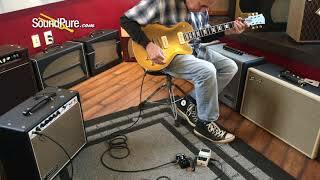 In this video, Sound Pure electric guitar specialist Eddie Berman tests out an Eastman SB56/N-GD Electric with a Carr Sportsman 19W 1x12 Combo Amp, an Xact Tone Solutions Imperial Overdrive Guitar Pedal, and a Boss DD-7 Digital Delay Effect Pedal. Looking for that screaming rock tone that first made you want to pick up a guitar? More interested in the textural playing heard on your favorite rock albums? We’ve got you covered — our solid body electrics are made with premium tone woods and quality electronics that result in a truly special instrument.